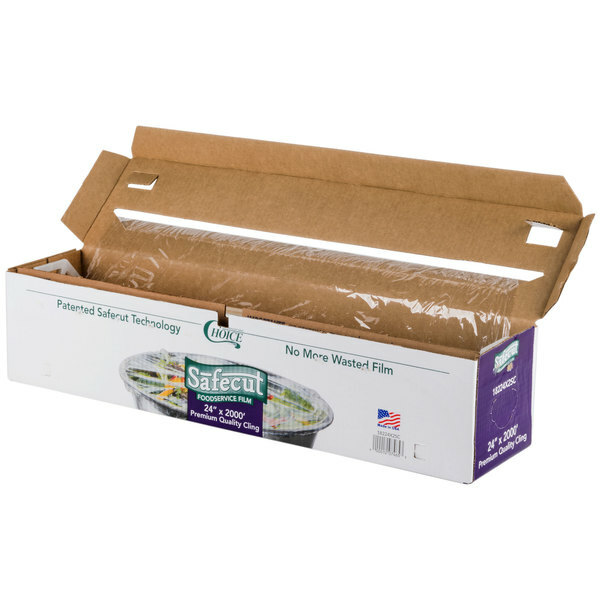 Easily cover, wrap, and seal in your food's freshness with this Choice Safecut premium foodservice film! Measuring at an ample 24" width and 2000' length, this film is perfect for covering big containers or bulky food items with large surface areas. 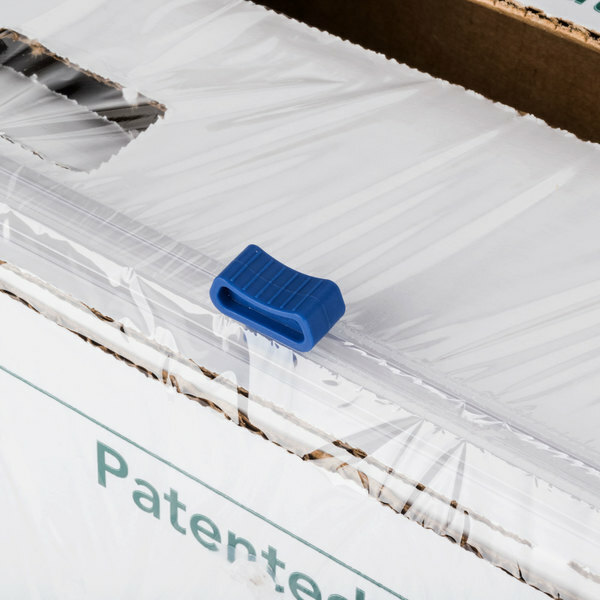 It comes encased in a sturdy cardboard box that features the innovative, patented Safecut technology, ensuring superior safety within your bakery, deli, restaurant, or catering kitchen. "This is HUGE! It is perfect for wrapping all my cupcake containers and boxes for transportation, freshness, and before putting in the freezer. A Must have for any bakery!" 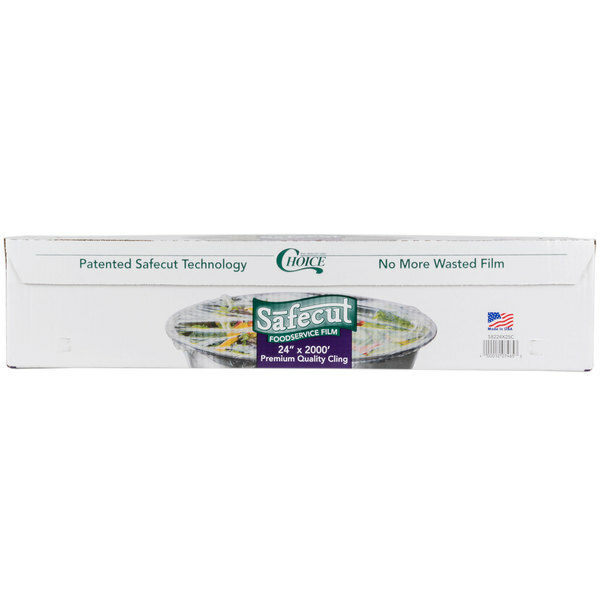 The Safecut technology incorporates a track and cutter that creates even cuts from both directions of the box for optimal versatility and efficiency. Thanks to the slim blade track, the cutter slices film effortlessly with extreme accuracy to minimize the amount of wasted film and reduce replacement costs. Since the blade on the cutter isn't exposed, it eliminates any accidental cuts or injuries that are prone to happen with comparable film wrap cutters. The included step-by-step visuals and instructions ensure easy set up and immediate use. 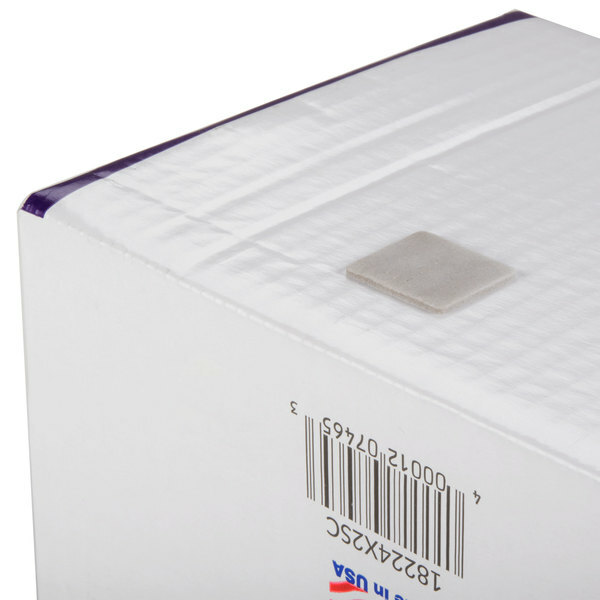 When you're ready to begin, simply pull the film up through the top slot of the box, cover your desired item, and slide the Safecut blade across the film to cut. Designing and creating products with the cost-efficient consumer in mind, Choice provides high-quality items for a low, economical price, and this Choice Safecut premium film is no exception! 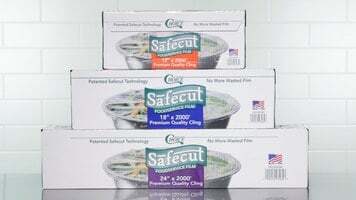 Keep your foods fresh and protected from the elements with Choice Safecut foodservice film! These rolls of film are 2000' long so you'll have plenty for your bakery, deli, or restaurant. You can choose between 3 width sizes: 12", 18", and 24". The 12" size is great for covering small to medium size containers, whereas the 18" and 24" sizes are great for large containers and large, bulky food items. 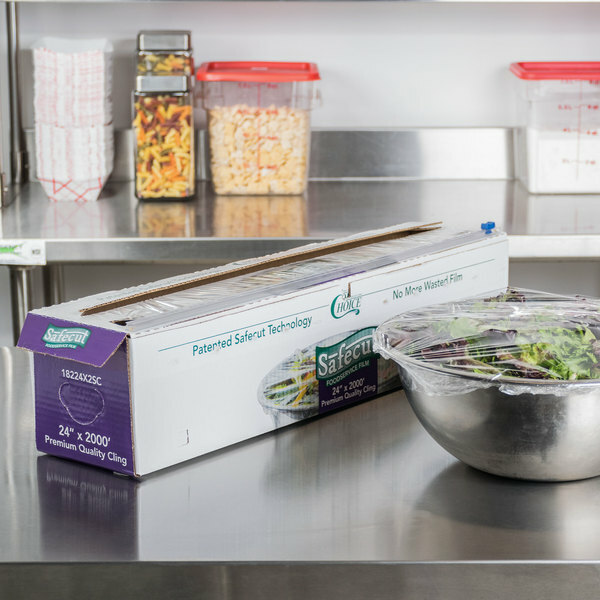 Each roll of foodservice film is packed in a cardboard box with a Safecut track and cutter. Simply pull the film up through the top of the box, cover your desired item, and slide the Safecut blade across the film for an even cut. Thanks to the precision of the blade, you can control how much film you use to help minimize the amount of wasted film. Not only is the blade precise, but it also promotes safety when in use. Since it is not exposed, it'll help eliminate any accidental cuts or injuries. The silicone feet will keep the box in place on prep tables to further prevent any accidents. 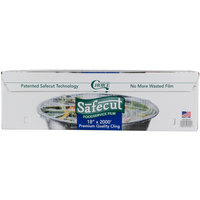 You can count on this Choice Safecut foodservice film to be a safe and extremely useful product at a great value. Its flexibility provides the perfect cling around your items, while still being strong enough to resist rips and tears. 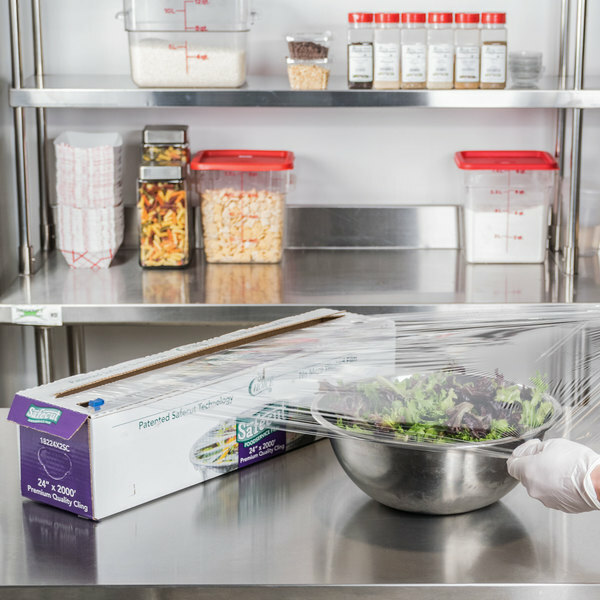 It will keep your food sealed, fresh, and ready for the next batch of orders. This is HUGE! It is perfect for wrapping all my cupcake containers and boxes for transportation, freshness, and before putting in the freezer. A Must have for any bakery! Cant say enough about this Choice brand of foodservice film. It is a great price and doesn't rip easily like other brands we have tried in the past. This is absolute garbage. There is nothing more irritating when the food wraps tears/rips on the edge every 2 feet and then have to take the time to fix the tear only to rip again! We have all been there and tried a lot of different brands and the Choice brand has been the worse so far. Thank you for your review! 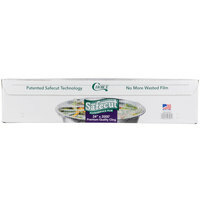 We are sorry this Choice Safecut 24 inch x 2000' Premium Foodservice Film with Slide Cutter has not worked well for you. A Customer Solutions Representative will contact you soon! Film works great. 2000’ is a huge roll. Last a long time. Have never had an issue with roll dispensing or getting stuck. Cutter comes off after a while if grease and water get onto box. Box doesn’t stay pretty for long either. Definitely going to consider the stainless case for rolls. But Choice is the way to go. 24" foodservice film is great. This stuff covers our sheet pans with no gaps. The slide cutter is so much better than a serrated cutter. I would have paid this price for the cutter alone. You don't realize what a pain having to twist and pull your plastic wrap is until you don't have to do it anymore. No more razor edges to cut myself on or to tangle up my wrap job and make waste. This makes wrapping up everything from small snacks to large foil pans easy and efficient. Great length to wrap sheet pans. Has a good cling and does not come loose. The slider cutter is such a better option then the serrated aluminum blade on the others. I would not expect there to be such a big difference between brands of plastic wrap, but there really use. We have used several different brands and had decided Darnel (the most expensive and probably most popular brand out there) was the best, mostly because it didn't seem to get stuck to the roll as often. However, this one outperforms that brand! It is much thicker, which means it doesn't flip back when using it, and we were able to use the whole roll without it ever getting stuck to the roll. For about $10 less than the other brands out there! 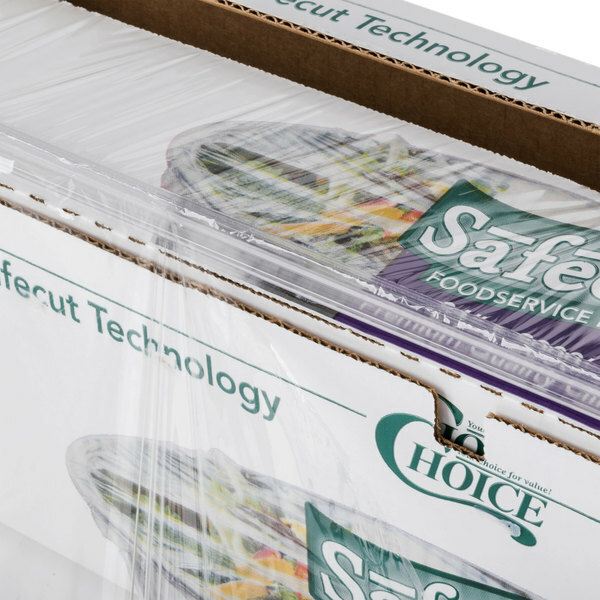 The choice safecut plastic wrap is awesome. With the slide cutter it makes it easy to cut the wrap quick and makes sealing containers a breeze. 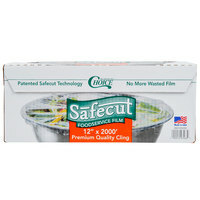 Choice Safecut 24" x 2000' Premium Foodservice Film with Slide Cutter is great. I love the 24" width, makes it much easier to wrap sheet pans and large bowls. The slide cutter is a must have now. No more film ripping and tearing. I like this plastic wrap because it comes in bulk and works just as good as any other brand out there. The serrated edges are convenient for cutting and other than than it does exactly what it is supposed to by saving food. 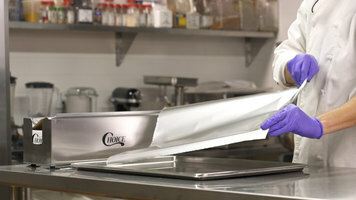 Love the size of this for wrapping sheet pans! Good quality wrap for the price. I personally like the slide cutter you just have to be sure the wrap is flat on the end and not bunched up before using the cutter. I am so happy with the Choice Safecut 24" x 2000' Premium Foodservice Film with Slide Cutter. The dispenser works great and the quality is very good. It was easy to use and not a hassle at all. 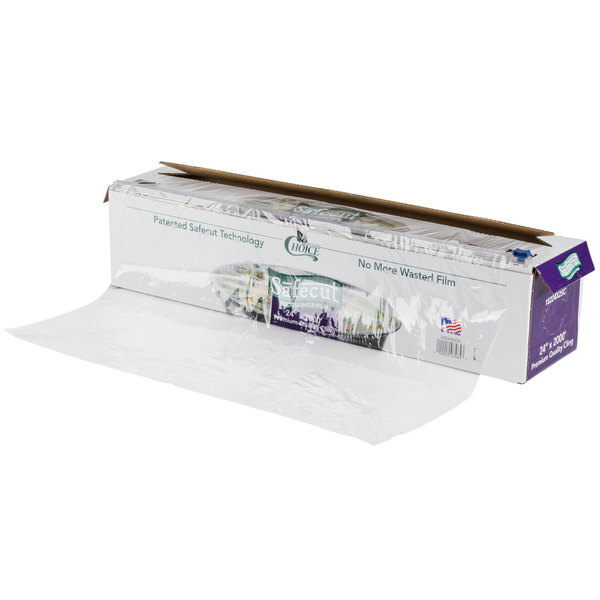 The Saran Wrap we purchased is 24" which is perfect for wrapping our trays. It makes wrapping a tray one pass instead of 2 which should save us in Saran Wrap let along ease of use. We are very happy with this purchase! Not my favorite plastic wrap. The cutter gets caught sometimes and the plastic piece that holds the cutter comes off every now and then. It's a thinner plastic so it's not great for heavy-duty applications. Otherwise a good buy for the money. I love the size of the film. And the method they offer to cut the film. It's a "ziplock" method that cuts the film instead of dealing with the aluminum teeth. However if not installed correctly, the plastic tab to cut the film can come off easily. Terrific Saran Wrap for our sub shops. We use it to wrap desserts, meat, and to cover containers. And the slide cutter feature cuts down on waste.